Two professional crits or high-speed bike races take place at Government Center each year, and is part what is officially known as the TD Bank Cycling Celebration. Cambridge, New Chardon, Congress, and State Streets are fenced off and bikes speed around a 0.7 mile course. There are several contests during the day, including a kid's race, woman's pro meet, mascot race, and a men's pro challenge. The men's race can be very exciting, as bikes reach speeds of over 28 mph when heading down New Chardon Street. There is also a festival at City Hall Plaza before the tournament, and an awards ceremony after the races. The Mayor's Cup can be very exciting. Railings are set up around a course that encircles Government Center. There are gates at all the major intersections, with crossing guards closing the gates when the riders are approaching. The crosswalk at Faneuil Hall is always packed, and pedestrians rush across the street in between laps of the races. There is also a pace car that beeps at spectators to alert them that riders are on the way. TD Bank sometimes distributes cow bells, which allows cheering the riders and also warns the crowd when they are approaching. The most exciting places to watch the race are at the two corners on Congress Street. The racers gain great speed coming down New Chardon, and whiz by as they take that corner. At the other end near the Old State House, the racers get bottled up as the street narrows, and then head up Court Street back to Cambridge Street. The race is about an hour long, so walking the entire course during each meet makes it even more exciting. There are two announcers in place (Cambridge Street at the finish line, and Congress Street near the Holocaust Memorial) if one would like to listen to the progress of the leaders at one location. As a spectator, one actually has to pay attention. Racers often lean over the railing on inside corners, and nearly cross the plane on the outside railing, depending on how wide they take the turns. Spectators can stand next to the railing to cheer on their favorite riders, but quickly clear the rail before the riders pass by. The men's race is quite fast, and pedestrian crossings become quite congested. Event staff must rush to close the gates just before the racers arrive each lap. There isn't a Boston Grand Prix or a Boston Rally Race, so the Mayor's Cup is the closest one can get to that style of racing, and is a unique event for Boston. About the tournament, the Mayor's Cup is a criterium or "crit" race, the most spectator-friendly bike race format in the world. Racers sprint around the short 0.7 mile course at speeds over 28 miles per hour. On many laps, the race officiator will ring a bell. During such laps, riders will take on each other head-to-head for mid-race competitions called "primes" (pronounced "preems"). Mid-race primes are considered "races within the race," as a rider can win up to a thousand dollars every time he or she crosses the finish line first. There is no prize for second place, so in going for these primes, a rider can tire out and limit his or her chances at winning the full race. 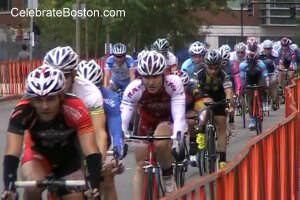 The winner of the crit is the first rider that crosses the finish line without being "lapped." After the Mayor’s Cup event, the Hub on Wheels charity ride takes place. Parts of Boston are closed to vehicular traffic, and cyclists can choose from three different routes to enjoy a ride. The scenic Storrow Drive route is very popular.